Posted March 14, 2014, at 8:15 a.m.
AUGUSTA, Maine — A Superior Court judge has overturned a decision by the commissioner of the state’s Department of Environmental Protection concerning noise complaints against a Vinalhaven wind power project, saying the agency head’s action had no rational basis. Maine Superior Court Justice Michaela Murphy’s ruling, issued Monday in Kennebec County Superior Court, criticized DEP Commissioner Patricia Aho for participating in the department’s handling of the Fox Islands Winds case. After three years of litigation, a Maine Superior Court decision has finally found in favor of wind turbine neighbors complaining about excessive noise from three nearby 1.5 megawatt GE wind turbines. Although citizens across the United States living near wind turbines are complaining — including lawsuits against wind turbine operators — this is the first court case where a state judge has found against a state agency charged with enforcement; the Maine Department of Environmental Protection. The judge’s decision follows the key claim of the plaintiffs who proved that FIW (Fox Islands Wind) was not complying with the State’s noise limits and that the DEP failed to enforce against the turbine operator or to require compliance. The immediate impact of the court decision is to remand to the state agency and work with neighbors to find an equitable way to measure and enforce against ongoing noise violations. For years Fox Islands Wind Neighbors has felt betrayed by the DEP for not protecting them by enforcing against excessive wind turbine noise. Falling back on their own resources, neighbors were forced to do noise measurements to state regulatory specifications — often in extraordinary weather conditions — , then engage in a protracted administrative process to clarify for state regulators the deficiencies of antiquated rules; rules never designed to protect people from wind turbine noise. Throughout the lawsuit, the wind turbine operator, FIW (Fox Islands Wind LLC), stonewalled both the state and the neighbors. It failed to produce data and information about the noise from the turbines, thumbing its nose at due process, and when the neighbors proved at their own expense that violations were occurring, the wind turbine operator flexed political muscle to operate the turbines its own way. The Vinalhaven wind turbines are permitted to operate at 45dbA at night time. In other parts of Maine, after complaints by neighbors and a public hearing process by the state of Maine, noise levels are 42dbA. This decision is an important step in the neighbors’ long battle that began in late 2009 when the wind project commenced, threatening health and depressing property values. But it is hardly the last word. 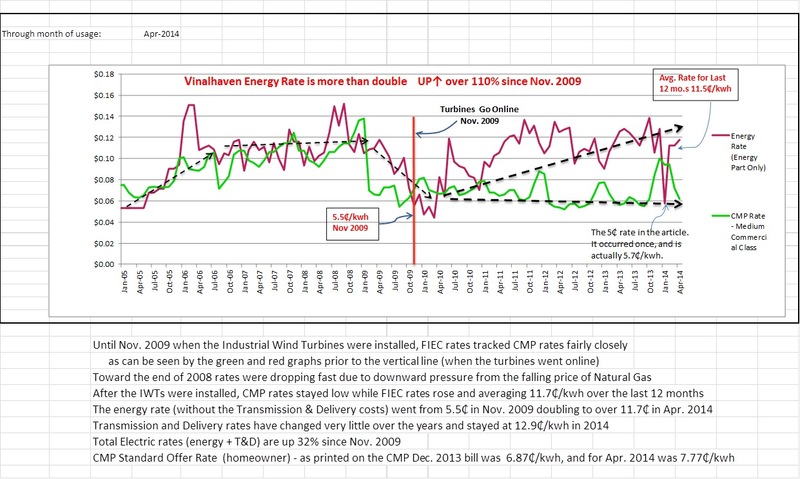 Fox Islands Electric Coop informed ratepayers (July 2013) that it has already spent more than $800,000 on behalf of the wind turbine operator’s legal troubles with the state. The wind industry has retreated from poorly sited turbine locations like those on Vinalhaven where wind shear and turbine placement present significantly more noise than predicted in the planning phase of the project. For example, Harvard Business School’s George Baker — former president of FIW and chief promoter of the project — assured neighbors and Maine DEP during initial permitting that turbine noise would be masked by wind rustling leaves. Baker, former Vice President of Renewable Energy for the Island Institute of Rockland, Maine, both minimized and ignored consultants who had warned of likely noise problems. In one Harvard Business School study of the project, Baker took pride in speeding the Vinalhaven project past likely objectors. Not one director of Fox Islands Electric Coop, Fox Islands Wind, or George Baker live within earshot of the Vinalhaven wind turbines. Around the world communities impacted by wind turbine noise are pleading for lower noise thresholds and, also, for improved acoustic metrics compared to poor standards in effect, today. Fox Islands Wind Neighbors look forward to working with the DEP to formulate protocols that will assure compliance by FIW in the future. As 2013 draws to a close, we offer the following update on litigation involving Fox Island Wind Neighbors, Maine DEP and Fox Island Wind. In mid July, oral arguments were heard in Maine Superior Court, almost three years after the original lawsuit was filed by the neighbors. After the appearance in Maine Superior Court, the neighbors offered to participate in mediation to resolve the lawsuit against Maine DEP for failing to enforce against turbine noise violations by the wind turbine operator, Fox Island Wind. Finally, after considerable time and effort, Maine DEP and Fox Islands Wind rejected our request for transparent, easily-accessible data from the wind turbines. The litigation is back before Maine Superior Court. We hope for a decision by the Court by spring time. We have learned wherever wind turbines are located too close to people and private property, there are complaints by neighbors exactly like ours. We have also learned that some communities are willing to stand behind neighbors who are afflicted. The neighbors are exploring additional legal options to protect property values, quality of life and health from noise impacts of the turbines.